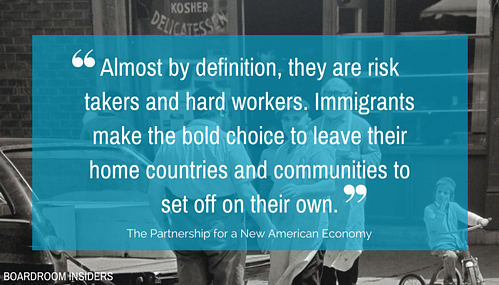 Stories of successful immigrants abound in American business lore. It’s a phenomenon firmly rooted in our country’s history. Alexander Graham Bell, the Scotland-born inventor and entrepreneur, founded Bell Telephone, which eventually became AT&T, in 1875. Other well-known Fortune 500 companies founded by immigrants include Intel (Andrew Grove/Hungary), Procter & Gamble (William Procter/UK and James Gamble/Ireland), Comcast (Daniel Aaron/Germany), eBay (Pierre Omidyar/France), and Google (Sergey Brin/Russia). Then there are the children of immigrants who went on to found companies that are household names: Jeff Bezos of Amazon is the son of a Cuban immigrant. Alexis Ohanian of Reddit is the son of an Armenian refugee. Steve Jobs’ birth father grew up in Syria and studied in Lebanon before moving to the U.S.
There’s no shortage of research on immigrant-founded and led businesses in the U.S. 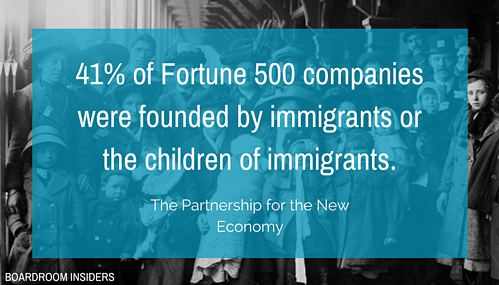 According to The Partnership for the New Economy, 41 percent of Fortune 500 companies were founded by immigrants or the children of immigrants. The National Foundation for American Policy’s research found that immigrants have started more than half of America’s 87 startup companies valued at $1 billion or more and have created an average of approximately 760 jobs per company. Inc. Magazine maintains that without immigrants, there would be no Silicon Valley as we know it, noting that in the ‘80s and ‘90s, the area attracted more foreign-born scientists and engineers than any other part of the country. In the last decade, the pace has intensified with the most recent crop of immigrant success stories including the pioneer of online payments, electric vehicles and space travel Elon Musk (South African); Arianna Huffington (Greek) Co-Founder of Huffington Post; Steve Chen (Taiwanese) Co-Founder of YouTube; Jan Koum (Ukranian) Co-Founder of WhatsApp ; Mike Krieger (Brazilian) Co-Founder of Instagram; and Adi Tatarko (Israeli) Co-Founder of Houzz. Another interesting data point: immigrant founders started a whopping 52 percent of new Silicon Valley companies between 1995 and 2005. By 2012, immigrant-founded engineering and technology companies in the U.S., mostly located in California, employed more than half a million workers and generated $63 billion in sales. But the data also show that the immigrant business story isn’t strictly about founders when it comes to securing the top job. That same National Foundation for American Policy study found that immigrants are key members of management or product development teams in over 70 percent of those $1 billion startup companies. 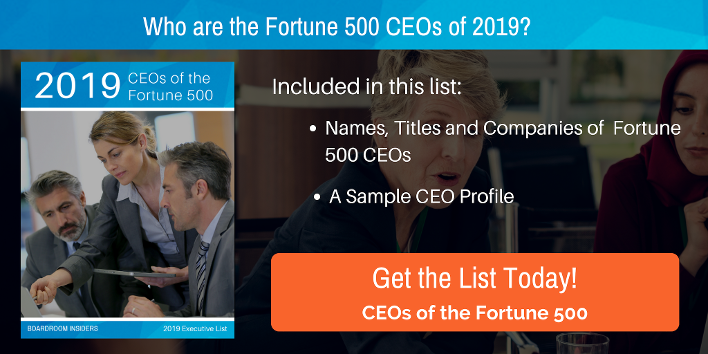 Boardroom Insiders’ 2017 research reveals that 3 percent of Fortune 100 CEOs were born outside of the U.S. Across the entire Fortune 500, 11.6 percent of CEOs were born abroad. Some of the most iconic American brands—Microsoft, Google, McDonald’s, PepsiCo, and U.S. Steel, for example—are today led by foreign-born CEOs. These CEOs come not just from Europe anymore, but from India, South Africa, Australia, Argentina, Brazil, Cuba, Israel, Iran, and more. But here’s something else to ponder: In an era where globalization is a business imperative, does it take a global citizen to successfully run a Fortune 500 company? Perhaps, having experienced the world through a broader prism, they bring a global perspective to their roles. They move easily between cultures and have direct knowledge of how business people, governments, and customers in other countries think and operate, which can be invaluable when running global organizations and trying to crack new markets. What we also found was that when these immigrant CEOs talk about their journeys, they emphasize qualities like tenacity, humility and drive to succeed. They also put a premium on education and hard work. Some have had to overcome prejudice, making them value and prioritize diversity. 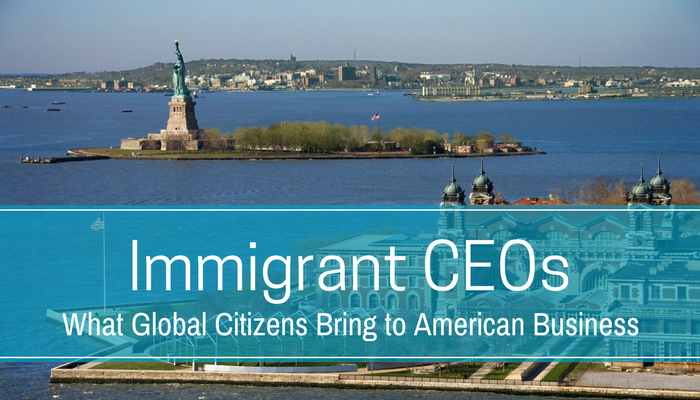 While these values are not unfamiliar to U.S.-born business leaders, immigrant CEOs don’t take these underpinnings of the American Dream for granted. Below we feature several immigrant Fortune 500 CEOs we’ve profiled so you can get a flavor for the contributions they’ve made to American industry. Note that we’re including Google’s CEO because, while the parent company is Alphabet, the majority of its business is currently driven by the Google subsidiary. Sundar Pichai was born in Chennai, India, moving to the U.S. to earn an M.S. from Stanford University and an MBA from the Wharton School of the University of Pennsylvania. Today, he’s described as the “most powerful man in mobile” and the “man behind Google’s most important products.” He started out taking various engineering and product management positions at Applied Materials and was also a management consultant with McKinsey & Company. He joined Google in 2004 as VP of Product Management, eventually overseeing the development of Gmail and Google Maps. After Alphabet was formed as the new holding company in 2015, Pichai was named CEO of the Google subsidiary. He still feels a connection to his native India, noting that the Indian education system, which nurtured him, needs to allow students to take risks and to fail, if it wants to produce more global technology leaders. Pichai is known for combining a deep passion for engineering excellence with a rare managerial quality of attracting the best talent into the teams he works with. Seifollah (Seifi) Ghasemi, Chairman, President, and CEO of Air Products and Chemicals, Inc.
Seifi Ghasemi knew from the age of 15 that he wanted to be in the U.S. Born in Mashhad, Iran, Ghasemi explained, “When I was 15, I went to a special school organized and run by the international oil companies that, at the time, had the concession for the exploration, production and refining of the oil from Iran. When I graduated, I was offered a scholarship by the oil companies to go to graduate school with a condition that I would come back and work for them. But by then, I knew where I wanted to be: I came to the United States to complete my education at Stanford University. After I completed my education, I went to work with William Lear—the man who developed the Lear Jet—on his project to develop and build a steam-powered automobile. Even back then, we were looking for better, safer alternatives to oil. Steam-powered cars and trucks did not turn out to be the route to the future, but working on them helped shape mine. In 1970, my wife – a third-generation American descendent of Russian Jewish immigrants – and I moved to Tehran, initially to teach at the university. I continued my work there in the manufacturing sector, working with the National Iranian Steel Industries Company to help develop a steel industry in Iran. It was an exciting, challenging time for me, my wife, and my son … until the Iranian Revolution in 1979." At that point, Ghasemi joined The BOC Group, where he stayed for 18 years before going to GKN Plc. in 1997, then Rockwood Holdings in 2001, and, in 2013, Air Products and Chemicals. In his first conference call with analysts in 2014 as Air Products’ CEO, Ghasemi said, "I am here because I believe that Air Products has the people, technologies and geographic footprint to significantly improve its performance. I consider it an honor and a privilege to lead and be part of this exciting time here at Air Products." One of her concerns is that Oracle is struggling to fill job openings in the U.S. because of a lack of qualified workers. She said Oracle has more than 1,000 open technical positions in the U.S. and that producing a technically educated workforce should be a top priority for the country and in particular for California, where Oracle is headquartered. "As an immigrant myself, this drives me crazy," said Catz. "The fact that it’s gotten so much harder for educated folks to stay here is really unfortunate because it means the jobs go [elsewhere] ... and potentially the jobs [the immigrants] could have created." On being a female executive, she told the Women’s High-Tech Coalition conference in May 2005 in Saratoga, California, "You have to be better. You have got to work harder, work longer, be louder." Her management style is called "tough’’ by former colleagues. Stanley Bergman, Chairman and CEO, Henry Schein Inc.
A South African native, Bergman has been Chairman and CEO of Henry Schein for more than 20 years. Bergman moved to the U.S. in 1975 and joined Henry Schein in 1980 after a short stint with accounting firm BDO Seidman. His experience in South Africa gave him a perspective on leadership. “My parents have a store in a place called South Endport Elizabeth. That community was one of the last communities to be desegregated by the apartheid government. So that community gave me the opportunity to understand people from different backgrounds and how they work together. But then it was also important to watch the untangling of that community, or the dissolving of that community, and the negative impacts of that. At the same time, I was involved in summer camp programs, where I saw the best leaders were those that could get everybody to play together. It’s not necessarily who’s the best sports person, but instead, the person who can be the coach, the facilitator, and the mentor. Those are the best leaders." Bergman was an accountant when he came to America in the ‘60s, and then a consultant to an accountant, bringing systems into Henry Schein, which he joined in the late ‘70s. During his time as CEO, the company has more grown rapidly from a domestic distributor of dental supplies to a multi-national corporation with eight automated distribution centers around the world and more than 200,000 customers. 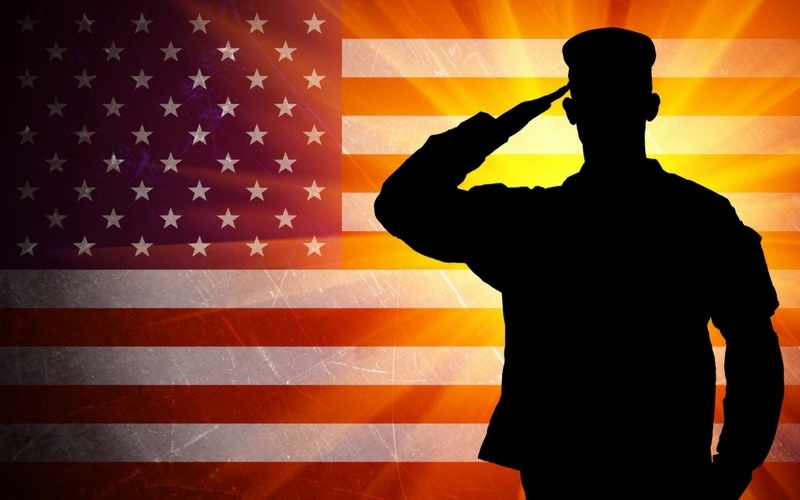 The biographies of these successful immigrants demonstrate that the U.S. continues to be a draw to some of the most talented, driven, and entrepreneurial people in the world, who are contributing billions of dollars to the U.S. economy.